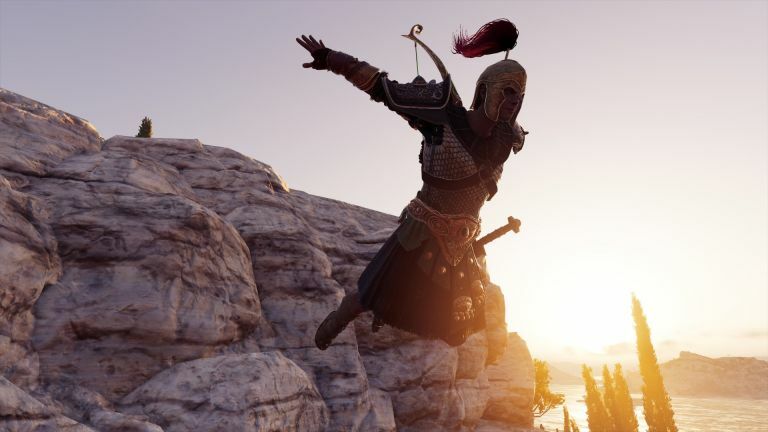 Assassin’s Creed Odyssey review: Does Ubisoft’s latest open-world adventure live up to the grandeur of its name? The biggest Assassin’s Creed to date winds back the clock to Ancient Greece and serves up a mixture of full-scale naval battles, real-time exploration and RPG questing. While it's marred by a handful of technical blemishes at launch (and a pervading lack of originality overall) Odyssey is still an enthralling action-adventure that borrows many of the elements you love - from Black Flag’s sailing to ACIII’s battlefields - and weaves them into a grand adventure worthy of its title. No one likes following up a breakout hit or a veritable return to form. For a series and enduring as Assassin’s Creed, it’s had plenty of entries that have struggled to emerge from the shadow of its predecessor. ACIII struggled to live up to the charm of ACII, while AC Unity was a far cry from the grand piracy of Black Flag. Now Assassin’s Creed Odyssey has the unenviable task of living up to the revitalised reboot that was last year’s Origins. But can a trip to the myths, wars and historical legends of Ancient Greece match that epic adventure amid the Pyramids? With an open-world significantly larger than Origins, vistas like this one are plentiful. Trading the rolling dunes of Ancient Egypt at the twilight of its power for the Peloponnesian War during the heyday of Ancient Greece, Ubisoft Quebec’s first major instalment in the series since 2015’s AC Syndicate serves up an open-world adventure that cherry picks popular elements from across the franchise. With the Aegean Sea filled with islands and peninsulas, the open-sea sailing and combat of Black Flag returns, and while it doesn’t add much new to naval warfare, you can see just how far the hardware has come since 2013’s pirate adventure. You can now explore any location on the map, leap aboard your battle-hardened trireme, fight and board another vessel then leap into all manner of underwater locations - all in real-time. Draw distances, much like Origins, are vast and being able to spy a distant mountain and sail to its island location all without a single loading screen never stops capturing the imagination. Oceans roll and broil, buffeting your ship as you sail, while the sheer breadth of locations to explore - ranging from the rolling fields of Eritrea to the Hot Gates of Thermopylae - make for the most diverse setting the series has ever boasted. While setting the game 400 years prior to Origins - where the Assassin’s Brotherhood is first formed - does make for an odd narrative choice in terms of the series’ decade-long story arc, it does make for an incredible canvas of famous historical locations, figures and events. With only a small smattering of trips back to the modern-day, Odyssey shows the series is finally accepting it’s at its strongest when it embraces the personality of its historical source rather than overdosing on its rote sci-fi stuff. Odyssey also marks the first time you can choose between two different characters, rather than switching between them much like Syndicate. Kassandra and Alexios are effectively the same characters on paper, but the vast difference in quality between their performances makes one of them a painful choice at best. Thankfully, the better of the two - Kassandra - is also considered canonical, which is just as well as she’s the best female character the series has ever produced. You can now select different dialogue choices, but she’s still a bold and fearless personality with an intriguing backstory and the kind of charming self-reliance that makes her a joy to inhabit. These choices will also shape the story, and can have a significant impact on the world around you. For instance, choosing to save a sick family about to be executed might seem like an act of pure compassion, but their survival could lead to the outbreak of a plague that affects countless others. This is just one of many decisions that will lead to multiple endings depending on how you elect to proceed. It’s just another thread that’s pushing the series further and further towards full RPG conversion. Kassandra is a brilliant lead, and you're left wishing Ubisoft had just gone with her and removed the ability to choose Alexios. The refined combat model introduced in last year’s entry returns, although it’s been tweaked a little to facilitate an extra layer of agency. You can now dodge a little farther by holding down ‘Square’/’X’ and slow down time if you time a dodge just right. Enemies now have an enraged state - so when they glow red you’ll need to pull back and dodge their unblockable attack or face losing a big chunk of health. Dogs have also been weaponised, making sneaking into camps and hideouts that little more challenging. With Ancient Greece having played host to some of the most famous battles and wars in history, Odyssey takes full advantage by introducing a new battle system. Drawing from the gangland mechanics of Syndicate, each region will either be controlled by the Athenians or the Spartans. You can destabilise the current power by killing soldiers, destroying war assets and assassinating captains. The leader of said region will start surrounded by high-level bodyguards in a fortified city, but reduce his power to zero and you’ll find him wandering unprotected or forced to sleep outside a fort in a tent. This then can be used to initiate a special battle, where you’ll need to kill a certain number of soldiers to win. It’s reminiscent of ACIII’s battlefields during the War of Independence, although Odyssey’s focus on combat (including that famous Spartan Kick, perfect for booting enemies off cliffs and into the sea) and those familiar brutal finishers, proves series has come a long way since the two-button attacks and parries of AC of old. Mario Tennis Aces review: a swing and a miss, or game, set and match Nintendo? Naval battles work much the same as Black Flag, although boarding other ships now automatically heals your own ship. Assassin’s Creed’s slow transformation into a full-on RPG continues in Odyssey, with the loot-based take on weapons and army further improved. Rather than full outfits, you can now mix and match helmets, chest-pieces, gauntlets and more. It’s nothing revelatory, but it’s a welcome tweak that keeps the flow of loot coming as you ransack chests, defeat enemies and complete quests. You’re always unlocking new weapons and gear, so you’re never bored with the same sword, spear or set of daggers for long. You can engrave each weapon or piece of gear to enhance it with a specific buff, such as additional damage when low on health or resistance to poison. It’s an age-old RPG trope, but it’s one that ultimately proves itself redundant considering just how rapidly you go through gear. Why seek out a blacksmith and upgrade your weapon if you’re going to replace it with a better one not so long after? That desire to become a proper action-RPG a la The Witcher 3: Wild Hunt also brings its own problems - notably multiple difficulty spikes that force you to grind side-quests in order to progress in the story. Mercenaries are a new addition to the franchise, which installs a bounty meter that gradually fills if you steal from houses or kill guards or targets out in the open. Reach one of five levels on this bar and a Mercenary will be dispatched to hunt you down. The more this bill fills, the more Mercs will enter the fray. These NPCs can be seen roaming the map in real-time, but they’ll eventually track you down so it pays to either kill the informant who turned you in or pay off the bribe from the map. It’s clearly meant to be a play on Middle-earth: Shadow of Mordor’s Nemesis System, with a menu that shows each Merc, their level, a unique ‘title’, a brief backstory and a randomised look. There’s a thrill to being half-way through a mission only to have a Merc ten levels above you suddenly appear, but considering it’s so cheap to pay off your bribes, it soon reveals itself to be a slightly more elaborate take on the Phylakes from Origins. There’s also a huge rogues gallery of targets to hunt down, offering plenty of ongoing content should you want it. There are, however, some noticeable technical issues. The game looks incredible and there’s rarely any slowdown or drop in frame rate, but we noted textures popping in a little too often for comfort. Your horse, Phobos, occasionally turns up as a white model before his skin pops in, while NPCs zoom around in the distance as the game hurriedly tries to load itself. These issues don’t ruin the experience, but that lack of extra polish shows that Ubisoft Quebec still has a lot to learn from the past efforts of Ubisoft Montreal. The high seas are dangerous, so you won't be able to take small boats out onto the oceans (unless you want to sink, that is). There’s no denying it, Assassin’s Creed Odyssey is the most accomplished and diverse entry yet. Its Greek setting makes for an enthralling melting pot of beautiful vistas, naval battles and historical battles. It’s something of a greatest hits for the franchise thus far, but by cherry-picking so heavily from its predecessors, it struggles to bring something noticeably different to make it stand out. Narrative choices and a choice of hero are a nice touch, but we’re hoping the series’ upcoming year off helps it find and maintain that extra spark that made Origins such a breath of fresh air. FIFA 19 review: can EA’s colossal footie sim raise some new silverware?